During the Tour de France, expert cyclist Champion is kidnapped by the Mafia and taken to the megalopolis of Belleville. Champion’s doting grandma, Mme. Souza, mounts a daring rescue mission aided by three ageing music hall stars and a geriatric dog. A Portuguese ‘old dear’ with a clubfoot, Mme. Souza is an unlikely cartoon heroine, but her relentless, resourceful spirit and her unyielding desire to protect her grandson is completely compelling. From the opening musical number, French Animator Sylvain Chomet throws in amazing set pieces and creates an original and enchanting world, with great supporting characters (hulking mobsters, sad-faced cyclists), and subtle cultural commentary (Belleville is a thinly-disguised USA). 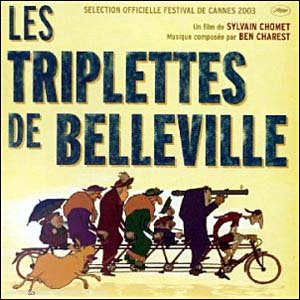 Les Triplettes de Belleville is not a new release, but it is an absolute must see. This is Chomet’s first full-length feature and it’s a wonderful adventure tale with a hymn for times lost. Chomet’s film maintains an emotionally resonant core as it mixes sadness with satire and complexity with nostalgia. Humorous and moving, this is an absolutely unique film that is arguably pure genius.